Now we see a lot of products from major software developers, but the first in this area was the company VMware, whose products have long proven themselves in the virtualization market and will be discussed in this article. We will not go into the technical details of the products of the company, but we will just understand the terminology of VMware and look at the basic differences between them. ESXi – is a hypervisor that installs on a physical server (servers) without an operating system and allows you to run multiple operating systems on one host computer. At the same time, operating systems work independently of each other, but can interact with each other or with the outside world via the network. Operating systems run on virtual machines that have their own virtual hardware. The ESXi architecture has fewer settings and is more convenient to deploy, so it is easier to maintain a virtual infrastructure based on it. vCenter – is a platform designed for centralized management of a virtual infrastructure, through which you can automate and provide virtual access to the virtual infrastructure. It is a very well-scalable and extensible platform capable of managing 1000 nodes and 10,000 virtual machines, which simplifies everyday tasks. The platform can be deployed in the shortest time and with the help of the built-in wizard and templates, it is able to create new virtual machines in a matter of minutes. vSphere – is the commercial name of the entire VMware product package, which allows quickly deploying a reliable and fault-tolerant infrastructure, integrating virtual systems, networks, and data stores into a single resource pool, while maximizing the performance, stability, and manageability of the entire system. 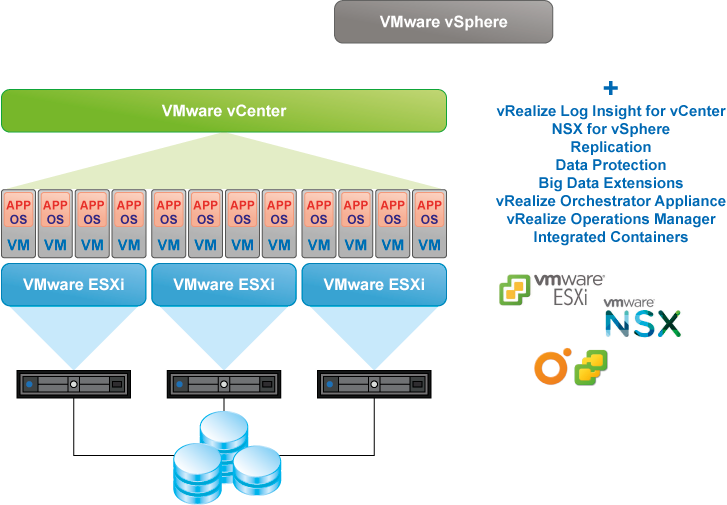 The vSphere product package consists of many components that perform different functions. Components for virtual networks provide network services optimized for the virtual environment, management and administration tools. Storage services provide the most efficient use of storage in a virtual environment. Security features protect virtual machines from viruses and malware. Backup and recovery services for virtual machines provide system recovery in case of a failure. 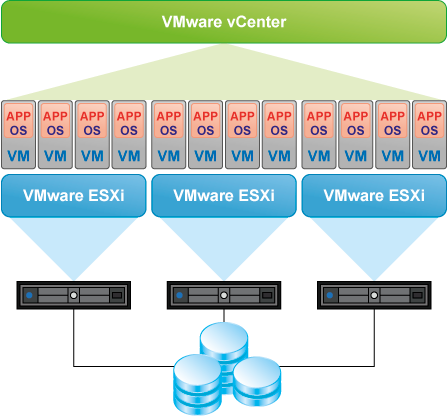 Packages vary in functionality and cost, but even the basic includes VMware ESXi and VMware vCenter. As we saw in this article, VMware’s terminology is not as complicated as it might seem before, and the difference between products is obvious. VMware ESXi enables you to deploy virtual machines on a single server, VMware vCenter is able to assemble such servers into a single whole and efficiently or manage, and VMware vSphere is a whole package of programs and services for more convenient management and monitoring of the entire virtual infrastructure.